I was taking HDR photos from on top of the hotel. The photos were taken in raw format and when I processed the photos into HDR images this object came into view. At first I thought it was a plane, as we do have an airport nearby, but the light reflection off the object did not change as the sun went down or as the object moved. This should not have happened. Dome shaped disk with kind of transparent upper part and lights on the lower part. It was partly metallic, and orange in color. Calm weather, dark blue skies with some clouds. No other craft were seen in the sky at the time. There were no electromagnetic effects, and no missing time. The object appeared on one of my serially taken pictures. I did discover the object later, after examination of the pictures I have taken. Actually, at the time of taking pictures I was not paying much attention to the skies as my objective was trying out different camera applications. 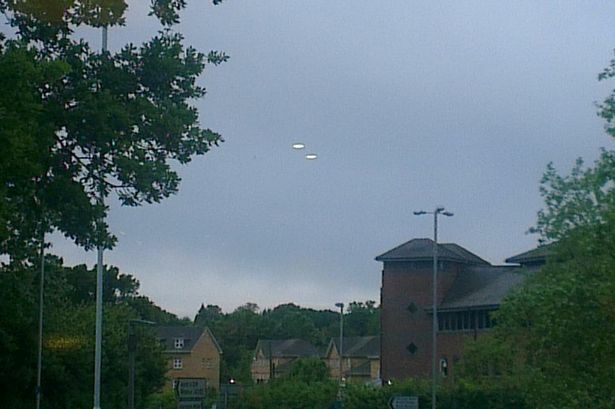 Harmans Water, Great Britain - June, 2013 - Photo taken of two disc-shaped objects over Bracknell last Friday. Courtesy of Steve Lambert. 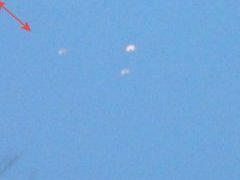 Former MoD UFO expert rates photo taken over Harmans Water last Friday - A former Ministry of Defence (MoD) UFO expert says a photo of UFOs over Bracknell is "one of the best" he has seen. Nick Pope, who worked at the Government's MoD for 21 years and investigated reports of UFO sightings from 1991 to 1994, last night commented on the photo taken over Harmans Water last Friday. Nick said: "It's one of the best UFO photos I've seen for a while. 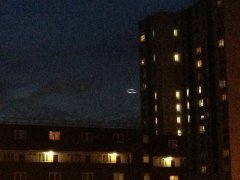 Basingstoke man Steve Lambert took the photo from the terrace in front of the Running Horse Pub, London Road, at around 8pm, after spotting the two discs in the sky. While staying at the Orlando World Center Marriott Resort in Orlando I stepped onto the back porch to make a panoramic photo of the sunrise. While taking a series of 3 photos I noticed a curving brighter line in the clouds. I assumed it was part of a contrail and paid no further attention until it came time to process the 3 photos into a panorama a day or two later. After loading the 3 digital Olympus RAW file images into my computer and into Photoshop the bright curve caught my attention again. When I blew the image up to 1:1 pixel view I was astounded to see that my "contrail" was actually a sharply defined disc resting in the clouds about 15-20 degrees above the horizon. The disc was tilted toward me, the top partially obscured by the clouds, but the bright edge of the disc very clearly visible. 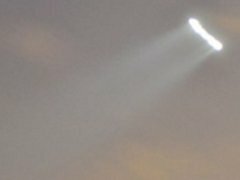 The office, known as the CEFAA (Committee for the Studies of Anomalous Aerial Phenomena), is located within the Ministerial Department of Civil Aeronautics (DGAC), the equivalent of our FAA, under the jurisdiction of the Chilean Air Force. 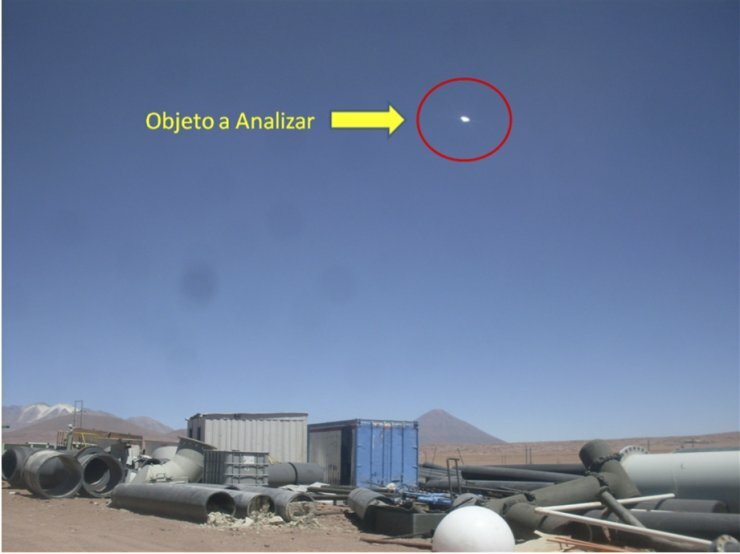 It is responsible for the analysis of selected reports of unexplained aerial phenomena in Chilean airspace, most of them from pilots and aviation personnel. The photos were taken at the Collahuasi copper mine, more than 14,000 feet above sea level in the Andean plateau in the far north of Chile. 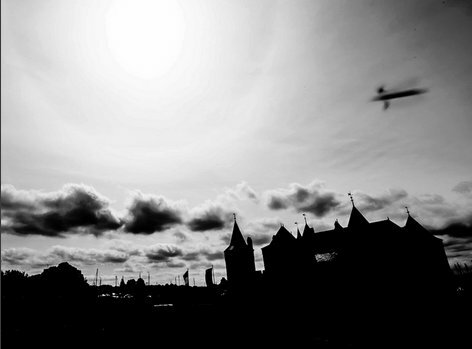 May, 2013 - Literally faster than the eye could follow, an unusual object was accidentally photographed above the landmark Muiderslot Castle in the Netherlands. On May 25, photographer Corinne Federer was with a group of people who visited the medieval castle built in 1285 near Amsterdam. Federer was shooting High Dynamic Range, or HDR, photos. "In order to create HDR images, you take three or more exposures -- this one happened to be five -- and you shoot them all at the same time, because you then overlap the images and it gives you the full spectrum of light, which your camera can't capture but your eyes can," Federer told The Huffington Post in an exclusive interview. 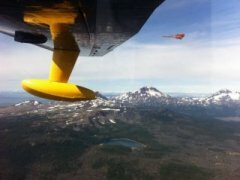 2012 - Oregon - I have been flying for 40 years. I am also a certified A&P mechanic and an IA or inspector with over 25 years maintenance experience on planes like these. The Albatross we have is used as a test bed for Satellite broadband internet. 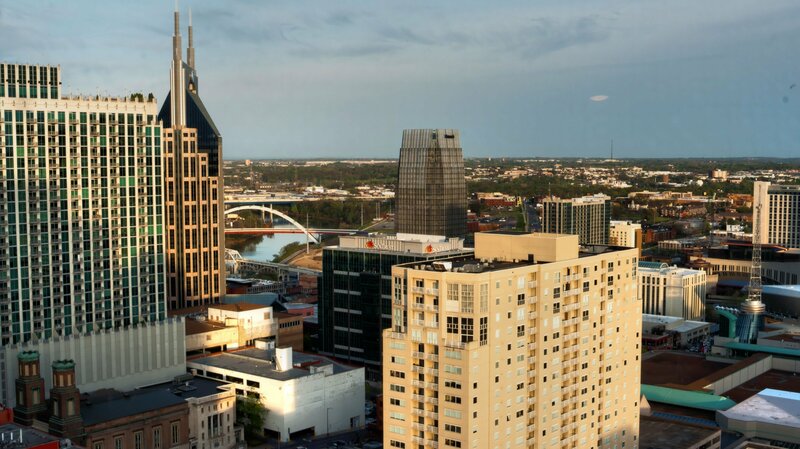 We are one of the few companies in the world that has airborne satellite systems for high-speed internet. The plane is full of sophisticated equipment for this purpose, as it is the original test bed for this. I have better than 20/20 vision, and I usually can spot any single helium balloon of 15" diameter from a great distance and I am trained to do so. I see them all the time. 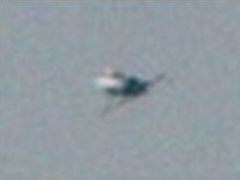 That being said, the object was literally a blur and I didn’t see it as it was moving in the same direction as the plane. The order of the pictures attached here is the series of the 3 that I took with my iphone as I was just trying to get a shot of "Sisters" and Mount Jefferson in the Bend area. As for the pictures, they cannot be a balloon cluster as this thing passed us! 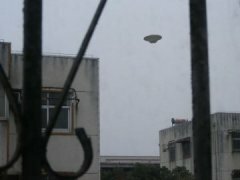 According to UFO investigator Ho Hsien-jung there have been 15 recorded sightings where photographic evidence suggests that extraterrestrial objects have traversed the skies above Taiwan. The earliest of these pictures was taken in Taitung City (¥xªF¥«) in 1961. 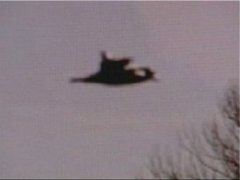 UFO photographs date to 1911 in China proper. 2012 - Pidcoke, Texas - 06-06-12 - A triangle-shaped craft was observed just to the south of Gatesville, Texas on June 6, 2012, at approximately 0525 hours. 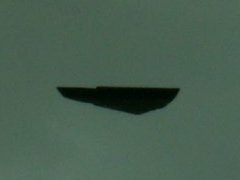 I was traveling northbound on Highway 116 just north of the city of Pidcoke, when I spotted the object. I had observed the object as I entered the south side of Pidcoke a few minutes earlier. At that point, I thought it was just an airplane. All I could see was a white light to the left side of the highway. I noticed the object moved to the right side of the highway. As I barely passed the north side of Pidcoke, I saw the object much more clearly. It had moved back to the left side of the highway in a zig-zag motion. At that time, I realized this was not an airplane. 2012 - Kennington, London, England - 07-31-12 - The sighting occurred on Tuesday, July 31 at about 10.23 pm by my daughter Chenade Hosein. I know this because she rang me as it was occurring, I told her to take pictures and they are the ones I forwarded to you. This took place in Kennington which is in London, England. My daughter was waiting for her boyfriend to visit. She looked outof her balcony to the street to see if he had arrived but he was not there. As she was looking this object caught her eye. 2011 - Hazelton, Pennsylvania - 08-23-11 - I did not witness this, but am reporting what a family friend saw. I received the pictures and interviewed the friend in great detail to put the report together. Our friend, about 15 minutes after experiencing the minor earthquake, went outside to look around and observed a black diamond-shaped object hovering or, moving very slowly in the sky. Curious as to what the object was, the friend took a couple of pictures with a cell phone. Our friend isn't a great judge of distance, but believed the object was large and very high, probably at cloud level. 2011 - Manhattan, NYC - 09-17-11 - The event occurred last Saturday 9-17-2011 in the early afternoon. I was taking digital photographs from the roof terrace of the new Museum located on Bowery in Manhattan's Lower East Side. I was shooting a series of images of the downtown Manhattan skyline to get some pictures of the Freedom tower construction. Because I had no tripod I was shooting at a very fast exposure rate 1/500th of a second. In addition, I was shooting in continuous mode at a frame rate of about 4 Frames per second. I took my pictures and left the location. Last night upon looking at the images, I noticed a diamond-shaped object moving very close to the horizon in four frames of my images. 2011 - Illinois - 11-01-10 - We were traveling north on I39 as we approached the Tonica exit, we noticed several objects, black against the evening sky, to the western horizon, presumed them to be helicopters, as we've seen a helicopter convoy through that area once before. 2010 - Colorado - 01-06-10 - We were traveling from Manizales to Medellín, specifically between Caldas and Sabaneta, before Envigado, when we observed these flying objects which I cannot define. At first, they appeared to be sitting in the sky, but then they began to move slowly. They also appeared to be spinning on their axes. We were able to take several photographs of the objects with a NIKON Coolpix L16 digital camera. 2010 - China - My name is the Feng Bin Rui, my English name is Brad Feng. I am a resident of mainland China. I am sending you two photographs that I took on February 27, 2010. The object in the photographs looks to be made of metal. It circled our apartment, and made a slight humming sound like electricity. We had seen several unusual lights in the sky recently, and we were also watching a fireworks display. 2010 - Canton, Georgia - 09-12-10 - 2205 hrs - I went outside to the back deck to put out the Tiki lights, when I looked towards the west, I noticed a strange, pulsating light in the western sky about 12 miles away. I could just make out some color flickering about the white light. I waited a few minutes and it didn't seem to move, I then noticed a high flying commercial jet between my view and the object, the jet was a little higher. I proceeded to go into the house to retrieve my binoculars and told my wife and daughter what I was seeing. They went to get the cameras, and began to take pictures to document what we were looking at. 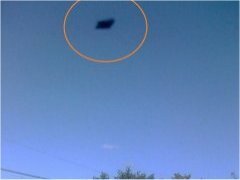 2010 - Here is a picture of a UFO spotted on November 5, 2010, 11:08 AM in Acojeja, Tenerife, Spain. Photograph taken by Annelies Middel, the Netherlands. We heard no sound, while the object on the photo is relatively close by. On Tenerife we hadn't heard any sound of planes that week. The little airport is too far away to hear that. You can see a straight line at the bottom of the object. It's a diagonal stripe pointing towards 2 o'clock, and it is attached to the main shape with another line, on both sides, symmetrically. It looks like a machine to me. 2010 - Idaho - 11-27- My son-in-law and I were deer hunting near Placerville, Idaho, around 11:15 AM on November 27, 2010. It was a clear day with some cloud cover and about 38 degrees. After hunting for awhile, I was getting bored and decided to snap a few pictures of the beautiful scenery. At the time I hadn't noticed anything out of the ordinary (except no wildlife), however, when I got home and downloaded the pictures off my camera, a Canon Powershot A550 71, I noticed something that I hadn't seen with my own eyes on the picture! Wichita man was out taking pictures of construction sites for his job when he said he saw a low flying, black shiny object. He said heard a sound like a fan whirring. He looked up and saw the object drop down and streak past faster than anything he ever saw. A local photographer believes he has uncovered evidence of extraterrestrial life. Last Thursday night the man, who wishes to remain anonymous, was taking photos of a storm at Burrewarra Point near Guerilla Bay. It wasn’t until later that he noticed something unusual. “I downloaded my photos and this particular shot was extremely bright, so I dropped the brightness out of it and added some sharpness,” he said. The local man said he was very excited with the results and took himself off to bed. 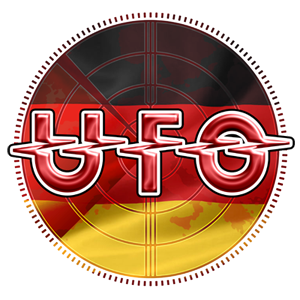 2009 - United Kingdom - Mystery surrounds an unidentified flying object spotted in the skies above Telford. 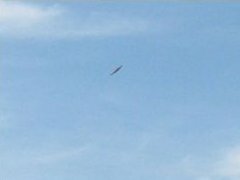 Reader Robson Bolam sent us these pictures of a mystery object which he saw over Donnington. And he is at a loss as to explaining what it is he photographed. But Mr. Bolam is not the only person puzzling over something they have seen in the sky. Mark Young, from Telford, told the Shropshire Star he noticed six or seven red and green lights above Clive Barracks at Tern Hill, near Market Drayton, as he drove along the A53 towards Market Drayton yesterday. He said he saw the lights at about 7pm and again an hour later when he returned. 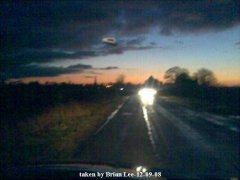 Thursday 4 pm - Brian Lee, 55, was driving on Billings Gate road in South Somercotes at 4.30 pm on December 9 and stopped his car to take some pictures of a dramatic sunset on his mobile phone. It wasn't until he returned home and looked over the images that he discovered the strange object in one of them. He said: "I looked at my phone and just saw this donut-shaped thing in the sky; I didn't know what to think it was." 2009 - South Carolina-I was sitting outside waiting for the mailman to come by my home. The weather was overcast most of the day. The object in my photographs made no sound. It was pretty far away. 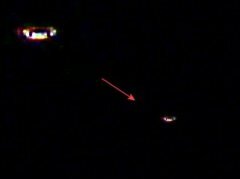 For more photos of the triangle, go to Triangle UFO Photographed over South Carolina. 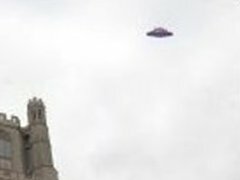 2009 - United Kingdom - A WOMAN in Ely has taken phone footage of what she believes is a flying saucer hovering over Ely Cathedral. The woman, who was walking her dog on Tuesday evening, sent us this footage last night. 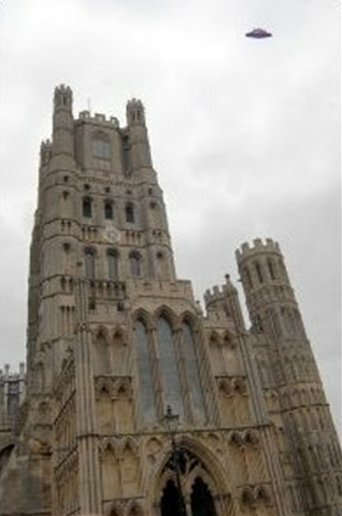 The resident took out her camera phone to capture this once-in-a lifetime event and sent the result to the Ely Standard. "The result was a bit blurry," she said, "because by that time I was almost as nervous as Maisie. You certainly don't prepare yourself for that sort of thing - I'm a natural sceptic about the existence of extraterrestrial life and had always poured scorn on the conspiracy theorists who thought we would all be beamed up into spaceships by 2010. 2009 - South Harrow, UK - April 6 - A mysterious light in the skies above South Harrow has been captured on film by an amateur photographer. 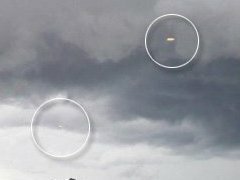 The unidentified flying object appeared through the clouds at about 7.45 PM, on March 31, and was snapped by computer network engineer Ahmad Zaigham. 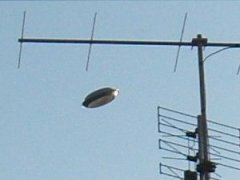 Mr Zaigham posted the picture on website Flickr where he said that he had spotted the alien ship out his window. 2009 - North Carolina - On March 5, 2009, at approx. 6:45 am EST, on the way down the sidewalk going to my vehicle, a bright object captured our attention. The object was moving erratically in the sky, and was slightly larger than the planet Venus just after dark or just before dawn. It was about 25 to 30 degrees in the morning sky about 6 to 10 miles away, and we were facing south. The digital camera we used was hand held and not on a tripod, as we were not expecting to capture anything that morning. The weather was clear, no cloud cover, no rain, perfect and cool. 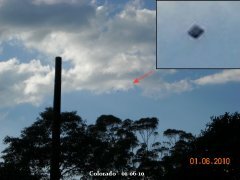 The object, as stated earlier, moved erratically for a short time, then stopped and hovered for about 5 minutes. 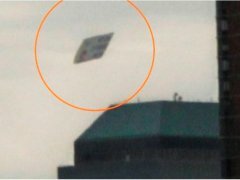 The photo numbered 705 is the picture of the object just hovering. 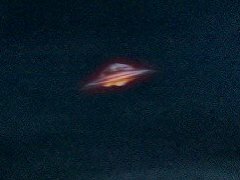 Once stopped, we could tell that it was shaped circular like a doughnut with lights of every color around the outside of the craft with a solid center. After hovering for 5 minutes or so, the object took off moving north relatively fast making no sound whatsoever. 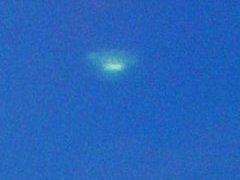 My wife, son and I were traveling home from Carlsbad Caverns on Friday, March 20, 2009, and around sunset my wife and son saw what appeared to be 4 lights hovering around 50 feet off of the ground, within a mile or so of the car (over some houses). My wife initially thought they were towers, but they all moved simultaneously vertically. These lights were pulsating (not at the same time). I immediately pulled to the shoulder of Hwy 285 and witnessed what was now 3 lights in a "V" formation (the 4th had disappeared). These lights rose vertically very slowly to a height of approximately 1000 feet in the air and after a brief pause began moving left (north) very slowly. It was getting close to sunset, and as the lights got further away the 3rd light appeared to be going slightly slower than the other two. When the lights were in front of a lighted area, I could see what appeared to be physical form behind the lights (for the first time). Shortly thereafter, a 4th light appeared in the middle of the other 3. 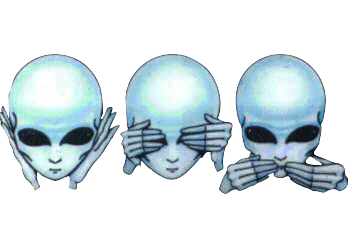 The object(s) continued moving in the same direction, then all 4 of them "flashed out" simultaneously. 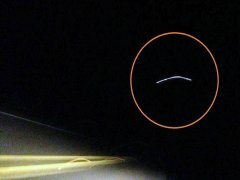 My wife, son and I tracked these object(s) from directly beside our vehicle to approximately 10 or so miles away (to the horizon) behind our vehicle. The flight pattern paralleled Hwy 285. 2009 - Greenville, South Carolina - 05-26-09 -The UFO Casebook received the following submission with three photographs. 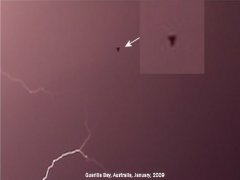 On May 26, 2009, at 12:30 PM, I was outside watching some thunderstorms pass by over my home. I had my camera with me, hoping to get a photo or two of some lightning. 2009 - Estonia - 08-13-09 - Photographed Moving Through Clouds in Estonia. 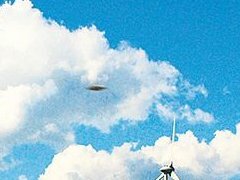 UFO punches hole in cloud above turbines. Photographer Avo Siim was taking pictures of wind turbines near the town of Virtsu on Estonia’s western coast when he noticed a most unusual cloud formation overhead. Something was blowing a hole in the cloud from above and sending out pieces of the cloud in a spiral underneath it. Mr Siim made sure to take shots of the formation and returned home. 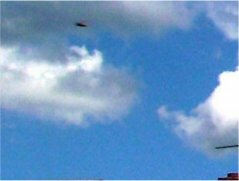 After developing the photos (below), to his astonishment, he noticed a UFO hovering above the turbines and just beneath the cloud at the very spot where the formation occurred. ‘I did not see the UFO with my eyes so it must have been fast’ noted Mr Siim. 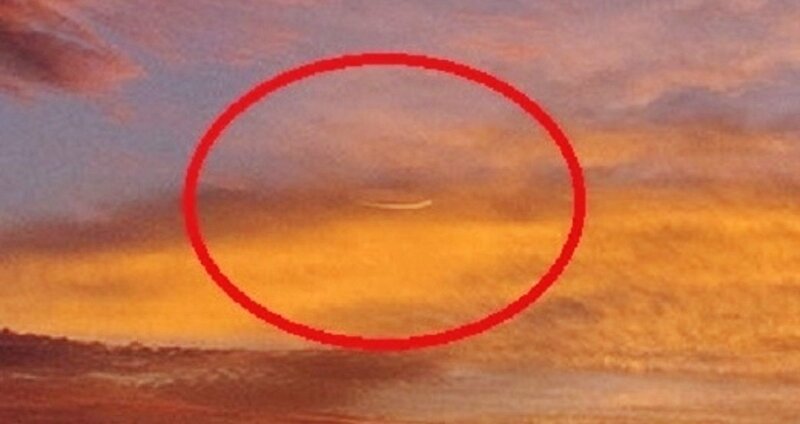 UFO experts in Estonia have examined the photo and declared it genuine. They have also attested to Mr Siim’s good character. 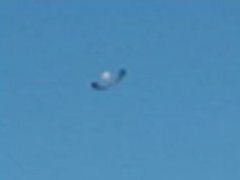 2009 - This eerie and rather pretty UFO (photo below) was snapped in New York City by a resident on the 4th of July prior to festivities and reported to MUFON, America's main UFO reporting and research agency. 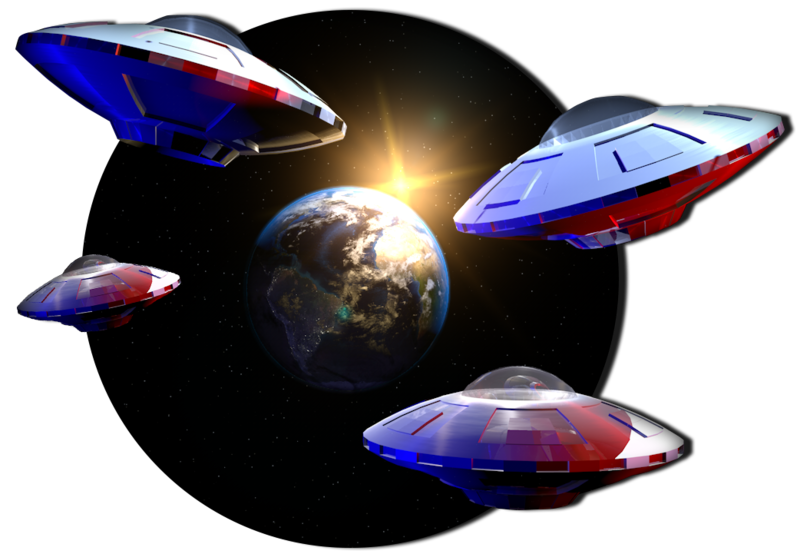 It is already well documented that aliens do take an interest in human celebrations and UFO sightings to tend to be more frequent at times of historical significance, for instance around the time of Obama Barack becoming President, when a definite spike in UFOs being reported was noticed by researchers. 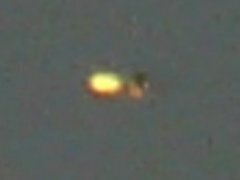 The witness and photographer of this UFO noted that 'A couple hours before the annual 4th of July fireworks in New York City, I decided to take a few pictures of the area and noticed an odd shaped disc. Thanks to Ken Pfeifer a Mufon investigator in N.J. and Mufon for this story. 2009 - Italy - On the morning of October 30, 2009, at around 8:30, Mr. LM stood on the roof of his house in Tor San Lorenzo (Ardea, RM), he was cleaning his chimney, when he noticed directly above his house a dark, disc-shaped object in the sky. The witness, then, realizing the incredible event he was involved in, rushed into the house, securing his digital camera (model KODAK EASYSHARE V803 DIGITAL CAMERA 8Mpx) and proceeded to the front garden. Heute waren schon 33870 visitors (72218 hits) hier!